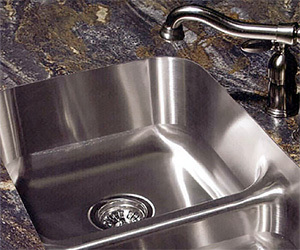 We offer undermount stainless steel sinks made by Karran. The Karran Edge Series sinks are specifically made to be fabricated into your new laminate counter, thus giving you a seamless transition from countertop to sink. 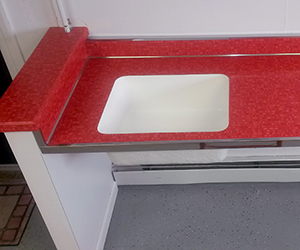 Add an E Series sink to your countertop and you will have the look you want with substantial savings. Remodel your kitchen and keep some of your money! Distinctive Features: The edge lip of the sink is mounted below a laminate countertop, so the sink effectively hangs underneath the counter, as opposed to sitting on top of it; creates a continuous flow from countertop into sink. Countertop Compatibility: Now designed for specifically laminate countertops. 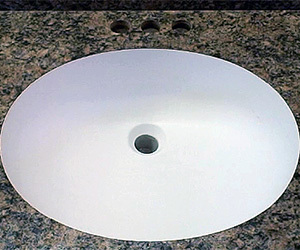 The identical function of a solid surface sink in a laminate countertop, at a huge savings. Pros: Wipe food scraps straight into the sink (granite has a caulked area under rim to catch crumbs and dirt); reclaim up to half a square foot of counter space; attractive, minimalist look, easy to clean. Price range: $450 - $800, depending on size and material. ©2019 Hallmark Countertops. All Rights Reserved.